We provide a comprehensive digital marketing strategy to sell your home. Our approach includes targeted Facebook advertising, email marketing, content marketing and personalized 1-to-1 marketing through our network of Realtors and Buyer leads. Stories drive action. 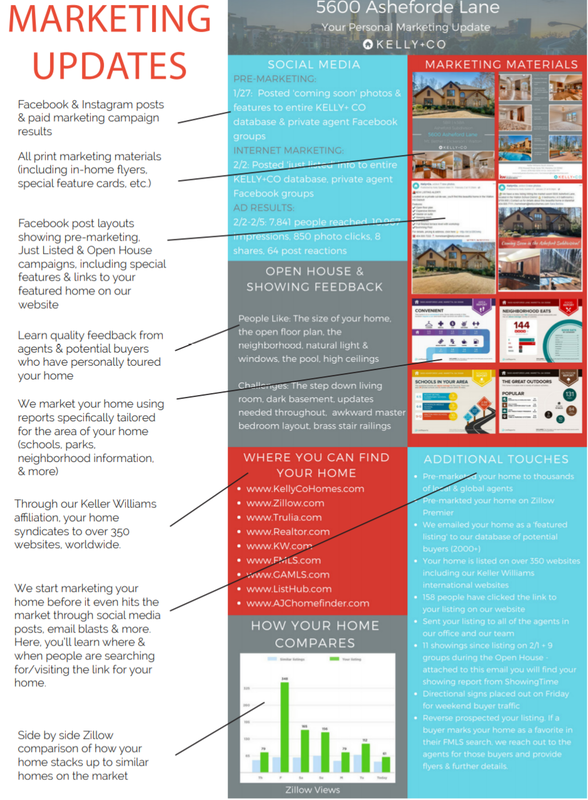 We tell a story about Walton Creek Estates through a series of targeted email blasts, sent to a carefully-chosen audience. We'll advertise Walton Creek Estates on Facebook to reach 10,000+ people and be sure to highlight the neighborhood and each floorplan's best features. This strategy helps engage buyers in a compelling way. We use our YouTube channel and Facebook account to upload videos! Our videos range from home property tours, marketing updates, to community spotlights, and more... to build a following of home buyers and sellers in our community that we love! We use Instagram to “build a buzz” around all phases of construction and connect with the community—ensuring a long list of buyers are engaged and interested in the on-going progress of Walton Creek Estates. We'll update you weekly to make sure you always know of the most recent marketing efforts made, feedback received, and any additional touches we have done. We use our 20+ years of agent relationships within East Cobb, Buckhead, Sandy Springs, etc... to “build a buzz” around all phases of construction—ensuring that any agents working with buyers in our price point and location KNOW about Walton Creek Estates' features and benefits. Premier agents receive benefits that hundreds of other agents do not get - including premier placement on websites such as Zillow, Trulia, and Realtor.com. Besides these 3 major websites, your listings will be syndicated to over 350 other websites. We will have coverage Tuesdays, Saturdays and Sundays. We know how important it is to get Realtors IN the neighborhood. Therefore, we will host a Broker Caravan complete with food & prizes. Prior to that we'll have "verbal & online caravans" by networking and marketing. With this app, we have another crucial outlet to find homebuyers. Your home automatically appears in this GPS-enabled app with a stylish photo gallery and listing details to showcase your home whether the homebuyer is searching at home or on the go. What floorplan do today's East Cobb buyers in the $1M-1.5M range prefer? Please rank the following elevations from most popular RIGHT NOW with your $1M-2M East Cobb Buyers to least popular.